It is rare when a novel speaks to the very core of me. Especially one which has been written in the 21st century. But Victoria, the girl who is 18 when we first meet her, captured my interest and my imagination from the very first page. But Victoria learns to communicate with flowers, for each particular name has its own meaning. (Aloe: Grief; Baby’s breath: Everlasting love; Chrysanthemum: Truth; Daisy: Innocence; Eucalyptus: Protection…) It is a gift that she learned from Elizabeth, the only woman who ever seemed to be a true mother to Victoria. The novel discloses a secret in Victoria’s life, one from which she has run since she was ten years old. But after it is uncovered, and she has run away once more, she must decide if she has the courage to claim what she really loves, a family, and the courage to accept that they do, after all, love her. Because to live in a family, one must be loving but also embrace the love which is offered in return; a very hard thing to do for those who feel unworthy. This is the novel I’m giving away for World Book Night on April 23. I think it should be on everyone’s shelf. This was one of my favorites of last year. I'll be giving it away on World Book Night as well. This is a really good book. I'm glad you enjoyed it. I enjoyed the audio version of this one as well. This is my next book to start!!! Now I am even more excited to read it! I've heard so many wonderful things about this novel, but have yet to pick it up. After reading your post, sounds like I must pick it up ASAP. What a terrific review! And it sounds like the perfect read to give away on World Book Night. As stated before my book is Jasper Fforde's the Eyre Affair. I've seen this novel in the reduced section of Waterstones for months now – if it's still there when I next visit, I shall certainly be buying it! It does sound like it would interest me. This does sound very worth reading. Thanks for a wonderful, concise review. I keep hearing wonderful things about this book. I think I will have to pick it up next time I go to the library. Wish Australia was participating in World Book Night. I must get to this one! This is the book I chose too for WBN! It should be fun giving this one out to light readers and non readers. Just finished! wow, I loved this book and could not put it down! Sara, I'm so glad you found it as moving as I did. There were several times I was afraid, but ultimately courage and love prevailed, which are two of my favorite attributes. This story is for every mother and daughter, it matters not if they are connected by birth. I think what moved me more was the impact that one person, one family or one event had on her as a foster child. It has given me some insight into what might be going through the minds of the children that will come into our home soon. 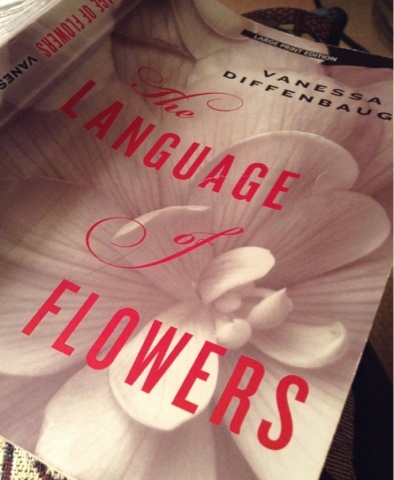 But also, the language of flowers was so intriguing to me and so beautiful. Absolutely! Your comment shows so clearly that is what's going on, and I meant to say that although I didn't do so very clever. It is through Elizabeth's faithfulness that Victoria is able to heal, along with the healing that she receives from the owner of Bloom. The flowers work, too, toward the healing process. But, of course, the most important part is the impact that we have on one another. It's kind of scary to me because I don't know if what I say has any impact, or worse, has a negative effect. Always, I try to keep the goal of an acceptance and love in front of me. And, I just know that the opportunity you and your family will give your foster child will provide just the foundation which is needed most.